In 1991, the communist leader of Ukraine, Leonid Kravchuk, renounced Marx and declared his republic’s independence from the disintegrating Soviet Union, becoming the first president of modern Ukraine. Starting on November 19, 2004, the Chinese-language Epoch Times began publishing the “Nine Commentaries on the Communist Party,” a series of editorials exposing the the history and nature of communist rule. The former Ukrainian president has commended the “Nine Commentaries,” particularly the effect it has had in encouraging tens of millions of Chinese to withdraw from the Chinese Communist Party and its affiliated organizations. “My immediate thought upon reading this book was that it and its author would transform the opinions of millions of people,” Kravchuk said in a Nov. 19 interview with New Tang Dynasty Television. Kravchuk noted the wide range of historical details the Nine Commentaries draws upon to explore the ideology and politics of communism. He said that the series, which has been translated from its original Chinese into 33 different languages, has also had a great social impact. “Not only has it [the “Nine Commentaries”] revealed the evil of communism, it also convinced millions of people to withdraw from the communist party. This book provokes deep reflection on the preservation of human rights, on the protection of human life, democracy, and freedom,” he said. The 80-year-old Leonid Kravchuk was, prior to his country’s independence, chairman of the Ukrainian Supreme Soviet. Along with Russia and thirteen other states, Ukraine was part of the Soviet Union until its breakup in 1991. In August 1991, just months before the collapse of the Soviet Union, Kravchuk resigned from the Soviet communist party and vouched for independence. That December, the Soviet Union collapsed and Kravchuk was elected the first president of independent Ukraine. He was in office until 1994. Since 2004, more than 180 million Chinese people have renounced their ties with the CCP or its affiliated organizations, specifically the Communist Youth League and the Young Pioneers, with written or online statements. 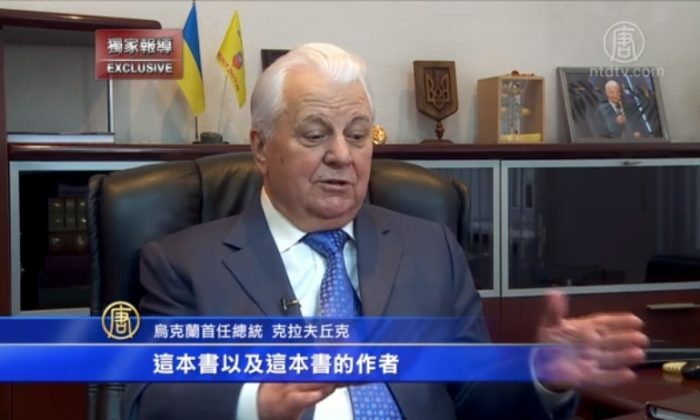 Though the “Nine Commentaries” focuses on the Chinese communist regime, Kravchuk saw the same underlying principles at work in the history of Soviet Ukraine. Under dictator Joseph Stalin, millions of Ukrainians starved or froze to death. Some Canadian parliamentarians believe a regime change in China is on the horizon with so many people having quit the Chinese Communist Party.